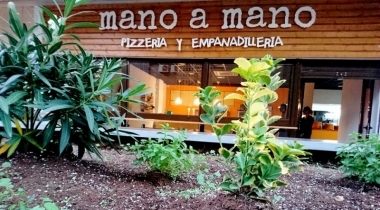 Mano a Mano - Pizzería y Empanadillería, Murcia, Murcia. Information, Photos and Reviews. Mano a Mano is a family company founded in Murcia, after the fusion of flavors of Argentina and Italy. We offer master mind three products: pizzas to authentic Napoli style, exquisite Argentine dumplings (or empanadas) and Neapolitan saltimoboccas, a delicious snack homemade bread which we do the same pizza dough. We also have other products that complement our extensive menu. Our priority is to work with fresh, craft and quality products at the lowest possible price, in order to get to everyone. Also at Mano a Mano consider customer relations aspect essential to our work, so we take care the most. We present our local as a new concept of fast food, which is not dispenses with the quality of products, but if served with plastic tableware, expediting and improving service. We can be found in the center of Murcia, next to Centrofama Mall, in a small place, casual but with a very warm and friendly atmosphere. Closer coffee and handcraft cocktails - Murcia (0.0 miles) - Cafeteria. Artisan cocktail. Jazz. Relaxed atmosphere, ideal for couples and small groups. Nobody has reviewed Mano a Mano - Pizzería y Empanadillería yet, Be the first. You are submitting a booking enquiry. Mano a Mano - Pizzería y Empanadillería will then contact you by email with details of availability and prices.